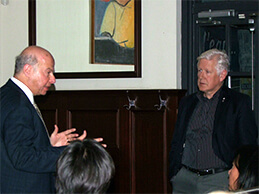 Our Commercial and General Litigation Group was pleased to welcome Bob Rae at a speaker’s dinner for colleagues and clients on April 24, 2014. Guests enjoyed the fine French cuisine of Le Select Bistro on Wellington Street followed by The former leader of the Liberal Party of Canada’s candid views on the many scandals afflicting Canadian politics. The Commercial and General Litigation Group have been hosting speaker dinners for several years now and they have proven to be a popular event for their business colleagues and clients. Past guest speakers have included Mayor, John Tory, Christie Blatchford of the National Post newspaper and Steve Paikin, host of the TVO’s, “The Agenda”.